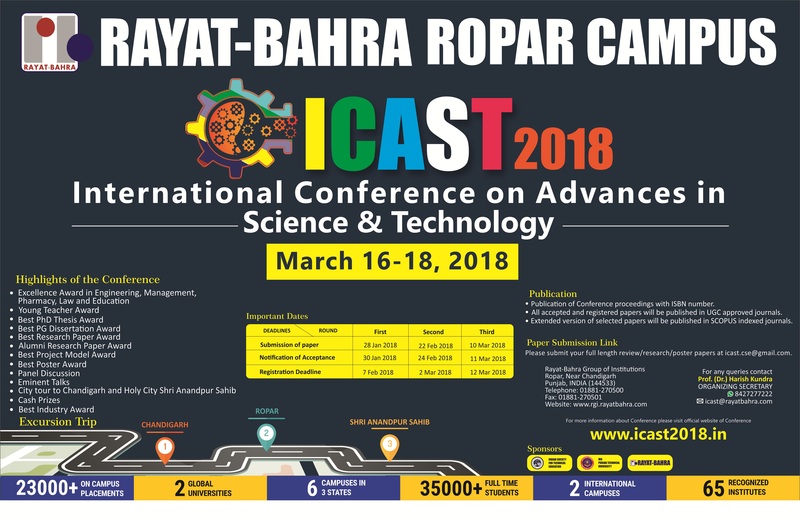 It gives us great pleasure in extending you a very warm invitation to attend an International Conference on Advances in Sciences and Technology (ICAST-2018) scheduled on 16th -18th March, 2018 at Rayat-Bahra Group of Institutions, Ropar Campus (Punjab ).Rayat-Bahra Group’s vision is to be one of the India’s largest educational group, with its world class teaching standards, outstanding faculty and innovative academic programmes. Our institution intends to set new benchmarks in Indian education by setting unmatched standards in the field of education through its industry and skill based programmes. International Conference on Advances in Science and Technology a Multidisciplinary International Conference serves as an outstanding platform for researchers to share their findings and thoughts with their fellow researchers across the world. This International conference aims to bring together leading academicians, industrialists, research scholars, scientists and students from various places in the world to exchange and share their experience and research results in computational model and recent trends in Science and Technology. Eminent Speakers from Top Academic Institutions, Research Organizations and Industry Professionals will deliver invited talks in the said conference. Participants from INDIA and Abroad are participating in the event. City tour to Chandigarh and Holy City Shri Anandpur Sahib.